Nucleic acid testing is a new age testing practice that helps in detection, diagnosis and screening of pathogens even when there is no relative clinical sign for a health condition. Due to the assistance provided by nucleic acid testing to healthcare centres and common public, the market is expected to have positive prospects in coming years. A new research report by Future Market Insights on the global nucleic acid testing market reveals has been titled, ‘Nucleic Acid Testing Market – Global Industry Analysis 2012 – 2016 and Opportunity Assessment 2017 – 2027,’ and assesses the growth prospects of the nucleic acid testing market for the next nine years. The global revenue of nucleic acid testing market are foreseen to reach beyond US$ 4,900 Mn by the end of 2027. Over 2017-2027, the market is expected to expand at a robust CAGR of 7.5%. Nucleic acid testing is helpful in the detection of the nucleic acids such as viral DNAs or RNAs in specimen samples of the patients. The technique is helpful in providing special assistance to doctors as well as patients. The healthcare industry needs advanced technique to cope with the increasing severity of health related issues that the population is more prone to. Increasing chronic disease incidences due to changing lifestyle have resulted in escalating demand for diagnostic procedures worldwide. Nucleic acid testing kits and consumables are the key products in the in-vitro diagnostic industry, as they have been proven to deliver promising results during critical diagnosis in various applications. Emerging countries in the Asia Pacific region, such as China and India, are the hotspots for investments because of higher growth rate of diagnosis, treatment and research activities. 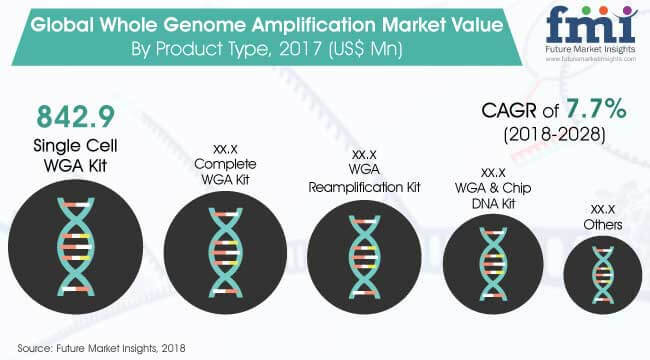 Future Market Insights expects developing regional markets to experience higher demand for nucleic acid testing over the assessment period. According to the report, North America is expected to hold a market value of over US$ 1,600 Mn by the end of 2027 but APAC is expected to create more incremental opportunities and will reportedly witness a CAGR of 8.6% during the forecast period. Looking at the recent demands for nucleic acid testing, key manufacturers are now focusing on introducing new custom product offerings for specific needs. Due to the research community’s ever evolving needs, the demand for specialised tools and reagents have grown to the point where most vendors who are currently offering these products cannot depend solely on sales of catalog products. Customised products are likely to trend in near future, creating attractive growth opportunities for emerging businesses. The rise in demand has also encouraged many companies to look for expansion of their businesses. Various companies are emphasizing on expansion activities by setting-up their plants and regional offices in developing regions, including APAC and MEA. The competitive scenario of the market is consolidated, and a majority players prefer to involve in sales and service agreements, collaborations, R&D, new product launches, joint ventures, partnerships, patent transfers, and mergers and acquisitions. The world’s first slide style palm vein authentication technology was introduced in the vein finder market by Fujitsu Laboratories Ltd. in 2017. This compact technology is capable of being integrated into tablets and benchtop mobile devices. In 2018, Vino Optics launched the Oxy-Iso Paramedic vein glasses, a pair of sunglasses to help physicians and phlebotomists easily locate veins through enhanced image display by filtering ultraviolet rays. This technology is supposedly beneficial for healthcare professionals suffering from colour blindness, as these vein finders help physicians locate veins by enhancing their ability to view reds and greens. 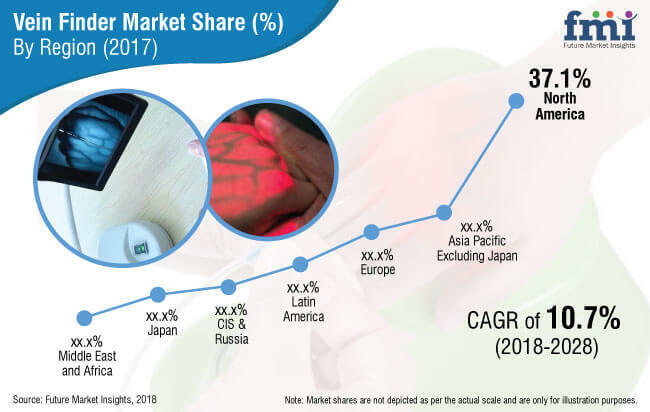 An overview of the market structure of the global vein finder market reveals a strong regional presence of top market companies as well as local players. Leading companies operating in the global vein finder market are leveraging acquisitions as a primary strategy to facilitate regional market expansion. Future Market Insights analysis also observes a strong focus by vein finder companies on R&D for new product development and expansion of the existing product line in key regional growth markets. In 2017, the leading three companies in the global vein finder market held a revenue share of about 56% while the remaining players contributed about 44% market share. New product development is a key strategy adopted by players in the global vein finder market to increase their brand value. Rising difficulties associated with peripheral venous access and venepuncture is one of the primary factors boosting growth of the vein finder market and key players are capitalizing on the growth drivers to increase their market share. Future Market Insights predicts lucrative revenue growth in the various regional markets of Europe and Asia Pacific Excluding Japan. Europe will likely remain the top market for sales of vein finder devices owing to increasing adoption of vein finder across hospitals and clinics to locate veins for drawing blood samples, IV insertions, and other vascular procedures. Portable vein finders are likely to be the most preferred product type in the global vein finder market, registering impressive demand as well as sales growth in the coming decade. The convenience and ease of use offered by portable vein finders is the primary factor boosting adoption across hospitals, clinics, and other healthcare institutions. The global vein finder market is fuelled by advanced technology with infrared technology being the most adopted in vein finders. Among the various end users of vein finders, hospitals are likely to exhibit the highest demand in the next 10 years, also contributing to maximum revenues in the global vein finder market. Leaders in endoscopy visualization systems landscape are also prioritizing innovative product launches, product portfolio extension, and strategic collaborations and mergers for an even stronger market footprint. Tier 2 and Tier 3 companies, making up for the rest of market revenue, are particularly focusing on regional expansion – especially targeting developing Asian economies. Prominently due to the paradigm shift to value based, sophisticated healthcare system and a mounting number of strategic mergers and acquisitions between leading medical device manufacturers, endoscopy visualization systems have been witnessing robust demand in recent years. “With an ever growing demand for minimally invasive surgical procedures and growing availability of low-cost diagnostic procedures, we expect robust expansion of the global revenue through endoscopy visualization systems. While endoscopy visualization systems currently account for a billion dollar market globally, it is more likely that the endoscopy visualization systems landscape will observe over 7% year on year growth in 2019. Relatively undemanding FDA clearance guidelines is another strong factor pushing the prospects for endoscopy visualization systems in the near future,” says a senior research analyst at Future Market Insights. The 3D endoscope visualization system has been an impactful innovation in the endoscope visualization systems landscape. While 3D visualization technology offers a deeper view of the diagnostic area during endoscopic procedures, constant R&D efforts have directed the innovations to the latest – customized 3D visualization. The world’s first-ever endoscopy visualization system (by MedicalTek) has been recently launched that works on an easy-to-set and easy-to-alter imaging technique and offers an adjustable 3D perception to resultant endoscopic images. The FMI analyst explains that ever-growing demand for minimally invasive surgical procedures worldwide, it is quite clear that high-range endoscopy visualization systems will continue to bring in maximum revenue to the marketplace. With a current market value share of around 50%, high-range endoscopy visualization systems will be the highest selling type of EVS owing to favorable reimbursement policies and availability of advanced technology systems in this segment. 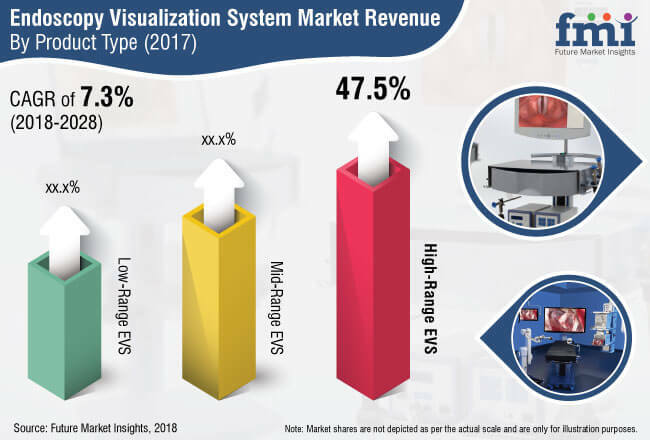 Mid-range endoscopy visualization systems are also identified to capture a considerable market value share in 2019, demonstrating the year-on-year expansion of over 7%. Recent statistical data published by American Society of Gastrointestinal Endoscopy (ASGE) indicates that among roughly 75 million endoscopic procedures annually performed at a global level, more than 65% are performed on the gastrointestinal tract, followed by the female reproductive tract. A considerable number of endoscopies are also performed through a small-sized incision with an objective to achieve least invasion. According to FMI’s projection for 2019, the year on year revenue growth will be around 7% in case of gastrointestinal tract endoscopy visualization systems, whereas that in case of small-sized incision procedures will be more than 7%. While developing economies are constructing a lucrative base for the growth of endoscopy visualization systems landscape through changing demographics and an expanding patient pool, Future Market Insights offers exclusive insights on the same. An elevating number of endoscopy visualization systems predominantly for disorders of GI tract, female reproductive system, urinary tract, and respiratory system is encouraging the sales of endoscopy visualization systems in emerging Asian economies. The FMI analyst says while unfolding the key attributes driving expansion of market within emerging regional territories, “While APEJ is at present the second largest market for endoscopy visualization systems after North America, Japan is also witnessing significant growth. This growth can be attributed to both, a healthy rate adoption of endoscopy visualization systems at hospitals, and impressively growing sales at specialty clinics”. A recently released global market intelligence outlook on sustained release excipients forecasts the revenue through sustained release excipients to surpass a million dollar value by this year’s end, of which just-under 1/3rd share belongs to North America. As a growing number of existing international patents are expiring and the prevalence of orthopedic disorders is increasing on the flipside, drug formulations and thereby sustained release excipients are constantly witnessing an impressive manufacturing outlook. Research identifies the largest revenue shareholding categories in sustained release excipients marketplace on the basis of product type, end user, and route of administration. Polymer is currently the largest product type category worth US$ 300 Mn, whereas gelatin represents the most opportunistic one. While oral route of administration remains highly sought after, injectable is presumed to gradually take over. Biopharmaceutical companies and CMOs pose fierce competition to pharmaceutical companies – the dominant end user of sustained release excipients. Click here (Preview) for an insightful view of sustained release excipients marketplace. “The top five players leading the competition in global sustained release excipients landscape account for a collective revenue share of over 50%, whereas a number of relatively small companies represent the rest. A majority of competitors have a limited offering portfolio and significantly depend on product differentiation for an edge in niche treatment areas,” explains a senior research analyst. “Product innovation and market expansion have been the top developmental strategies of companies so far, which are now complemented with strategic partnerships,” the analyst adds further. FMI underlines the critical role of strategic collaborations – between formulators of sustained release excipients and stakeholders across the value chain – in shaping growth of brands as well as the entire sustained release excipients ecosystem. While partnerships are expected to prominently focus on spotting the key challenges facing manufacturers, continued education about functionality, variability, and consistency of sustained release excipients is also be an important objective. Drug product manufacturers working in tandem with formulators of sustained release excipients is helping companies deliver best-in-class solutions addressing the most prominent pull factors associated with sustained release excipients. 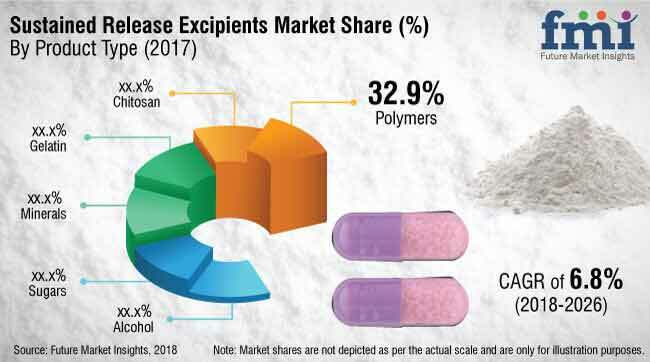 To best grasp real-time market needs, sustained release excipient formulators are most likely to strengthen interaction with end-use customers. This move offers a dual advantage as a developmental strategy – by helping manufacturers precisely understand and address the challenges facing pharmaceutical markets and stimulating development of new excipient formulations that tap into evolving needs. A recent deal (2017) involving the combination of The Dow Chemical Company-DuPont-FMC (Health & Nutrition) has been a classic example of collaborative operation, involving channel partners as well as customers. Advancements in laser technologies over the years have contributed to various applications of cosmetic treatments, contributing to the growth of the global photorejuvenation equipment market. Rising technological advancements with an increasing number of skin problem are anticipated to increase the adoption of photorejuvenation equipment globally. According to the latest research by the company, the global photorejuvenation equipment market is anticipated to account for over US$ 3,100 Mn, in terms of value, by 2028 end. The report on photorejuvenation equipment is expected to show significant growth potential with an average Y-o-Y growth rate pegged at 6.3% through 2028. Rising incidence of skin problems leads to scarring. Acne causes major physical changes which include permanent scarring. Furthermore, nearly 85% of people aged between 12 and 24 experience acne. The commonly used non-invasive treatment for acne scarring is laser resurfacing. The effectiveness of photorejuvenation equipment are widely accepted in dermatology for the treatment of a variety of cutaneous conditions. Thus, the rising prevalence of such skin problems is triggering the growth of the global photorejuvenation equipment market over the forecast period. Manufacturers are adopting strategic approaches in order to increase the product reach in the photorejuvenation equipment market. Increasing demand of photorejuvenation equipment for non-invasive photorejuvenation treatments, with frequent product approvals and advancements in photorejuvenation equipment technology, are further boosting the strategic activities like mergers and collaboration agreements among manufacturers and driving the photorejuvenation equipment market growth. Companies operating in the photorejuvenation equipment market are also continuously focusing on increasing the photorejuvenation equipment reach globally. As a result, they are adopting distribution agreements as an expansion strategy to gain maximum revenue share in the global photorejuvenation equipment market. Furthermore, advancements in laser technologies over the years have contributed to various applications of cosmetic treatments, contributing to the growth of the global photorejuvenation equipment market. Increasing healthcare spending is an indicator of improvement in the healthcare setting as a whole. Increase in the budget of hospitals would indicate the use of better quality equipment’s and thus drive the growth of the global photorejuvenation equipment market. According to the IMF, healthcare spending is expected to increase by over 6% yearly, based on the current GDP forecast. However, high treatment cost and adverse side effects related to the photorejuvenation equipment may hamper the growth of the global photorejuvenation equipment market. Treatment with photorejuvenation equipment, including surgeries and non-invasive treatments, are associated with high costs making them inaccessible to people in the low middle-income groups. Also, non-invasive treatments with photorejuvenation equipment require a series of sessions to achieve the desired result, which results in a high overall cost of the treatment. Furthermore, the duration of treatment, number of sessions and the cost of treatment depend on the area being treated. These factors are directly responsible for dropping the growth of the global photorejuvenation equipment market. According to the company, the laser equipment segment accounted for over 75% revenue share in the overall photorejuvenation equipment market in 2017. However, the growing popularity of LED and IPL might limit the segment’s growth in the near future. China photorejuvenation equipment market is expected to be the most lucrative market in the global photorejuvenation equipment market during the forecast period. The company has segmented the global photorejuvenation equipment market into Intense Pulsed Light (IPL) Equipment, Laser Equipment, and LED Equipment. In terms of revenue, the laser equipment segment in photorejuvenation equipment will hold maximum revenue share over the forecast period. 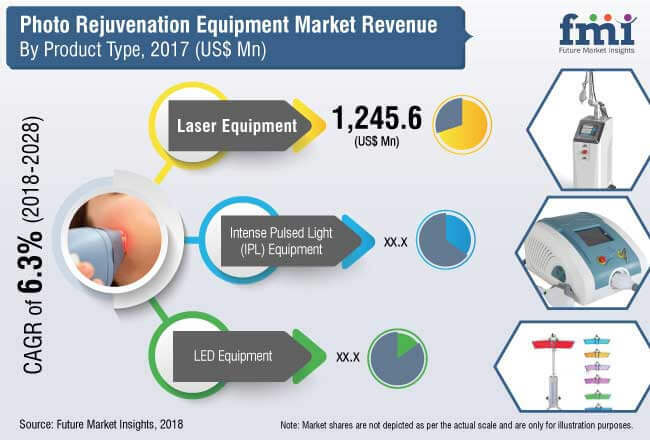 The company’s report tracks some of the key companies operating in the photorejuvenation equipment market, such as Hologic Inc. (Cynosure, Inc.), Lumenis, Syneron Medical Ltd., Lynton Lasers Ltd, EL.EN. S.p.A. (Deka Mela S.r.l. ), Fotona, Cutera, Inc., Lutronic Corporation, Beijing Nubway S & T Co., Ltd, and others. Increasing incidence of eye diseases such as cataract and refractive errors coupled with rising number of eye care clinics and hospitals globally are factors increasing the adoption of next generation optical biometry devices. With the advancement in the technology, next generation optical biometry devices have been developed aiding measurement of eyes before cataract and refractive surgeries. Earlier measurement by ultrasound technique was gold standard. However, unlike next generation optical biometry devices, ultrasound devices require direct contact of the probe, which lead to many eye infections. The next generation optical biometry devices are automated and measure many parameters such as the axial length, anterior chamber depth, thickness of the lens, retinal thickness, pupil size and many more. The next generation optical biometry devices are an accurate alternative for the precise measurements and provide efficient results. Also the next generation optical biometry devices avoid the operator variations measurements. Research indicates next generation optical biometry devices market is anticipated to account for revenues over US$ 450 Mn, by 2028 end. The report on next generation optical biometry devices projects market revenues to expand at a CAGR of 5.1% through 2028. According to Prevent Blindness organization, ~25 Mn Americans having cataract require medical care every year in the U.S., hence boosting demand for next generation optical biometry devices. Similar rising demand for next generation optical biometry devices is noted in UK with rising number of cataract surgeries. Increased demand for next generation optical biometry devices is noted in developing markets concurrent with access to eye care facilities. Next generation optical biometry devices are all-in one devices used for evaluation of lens and refraction, of retina. Rapid increase in number of probe infections due to usage of ultrasound devices, lead to post-operative errors fuelling demand for next generation optical biometry devices instead of ultrasound biometry devices. Manufacturers of next generation optical biometry devices are introducing automated devices which are more efficient in measuring segments of eyes. Players in next generation optical biometry devices market are working on strengthening the software, which could provide detailed information about eye segments. New next generation optical biometry devices introduced are taking into account irregularities and astigmatisms of the anterior and the posterior surfaces of the eye. The next generation optical biometry devices uses a partially coherent wave that has approximately 9x the resolution of a 10 MHz sound wave, for precise measurement of axial length. Hospitals end users segment account for 41.8% revenue share in the global Next Generation Optical biometry Devices market. Medical services and vision benefits offered under Medicare includes cataract surgeries; which will increase the demand of next generation optical biometry devices. Increasing geriatric population and rising income in Japan is expected to surge the demand for more advanced Next Generation Optical biometry Devices. Japan Next Generation Optical biometry Devices market is estimated to create absolute $ opportunity worth approximately US$ 1.21 Mn between 2017 and 2028. The company has segmented the global Next Generation Optical Biometry Devices Market into product type and end users. In terms of revenue, the swept source segment in product type in next generation optical biometry devices market report will account for significant revenue share over the forecast period. 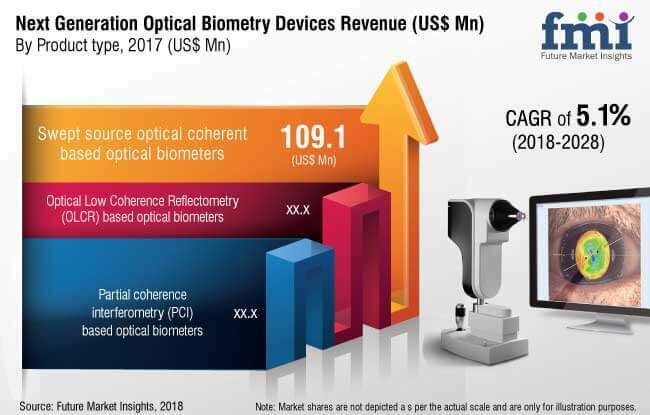 In contrary, the Partial coherence interferometry (PCI) based next generation optical biometry devices segment in all the markets will exhibit limited investment opportunities through 2028 in next generation optical biometry devices market. The next generation optical biometry devices market report tracks some of the key companies, such as Carl Zeiss AG, Nidek Co Ltd, Haag-Streit AG(Metall Zug AG), Ziemer Ophthalmic Systems, Optovue, Incorporated, Topcon Corporation, TOMEY GmbH, Movu Inc. (unit of Santec Corporation) , Newway Technology and OCULUS Optikgeräte GmbH. The largest player in the next generation optical biometry devices market is Carl Zeiss AG with its IOL masters and Haag-Streit AG’s Lenstar. Expanding at a rather modest annual growth rate of 4.6 percent, the global market for oxycodone is projected to reach a revenue of US$ 4 Billion in 2028—showcasing an absolute dollar opportunity of US$ 181.3 Mn, through 2018-2019. Future Market Insights, in its recent analysis of the global oxycodone market, elaborates on the key market dynamics, opportunity assessment, and regional and competitive landscape analysis, for a period spanning 2018 to 2028. Increasing patent expirations for branded products and much lesser new product launches, translating into increased consumption of generics—that contribute to the maximum revenue of the global oxycodone market, thereby, fueling the net sales. Growing number of cancer treatments, which in turn, increases the demand for supportive care medications for pain management. Increased prescriptions of oxycodone and Hydrocodone for treating cancer pain, will remain the largest contributor to the sales growth of the aforementioned medication. Elaborating further, the analyst explains that palliative care programs in US—which includes palliative care consultation teams and dedicated in-patient palliative care units—are delivered in accordance with the government and commercial reimbursement policies, further boosting the oxycodone market in the region. In addition to palliative programs, increased prescription in de-addiction programs, is well contributing to the demand of de-addiction opiates. In the in-depth analysis of the oxycodone market, FMI underlines the introduction of innovative opiate drugs, currently occupying a lion’s share. Innovations in formulations—not necessarily targeted at drug efficacy— is a critical supply-side driver in the global oxycodone market. Abuse-deterrent formulations in Oxycontin, by Purdue Pharma is one such example. Moreover, Purdue has been granted exclusive selling rights for Oxycontin till 2030, after it made formulations changes to the drug’s chemical structure, thereby marketing it as an ‘abuse-proof’, slow-releasing pill. In addition, FDA’s nod to new generation drugs, making them ‘less-addictive’, will gain prominence through 2028. Drug advancements in extended-release medications for pain control, would supplement to the sales of oxycodone, globally. This scenario is expected to create favorable adoption opportunities for long-standing oxycodone, notes FMI in its report titled “Oxycodone Market Global Industry Analysis 2013-2017 and Opportunity Assessment 2018-2028”. In terms of business expansion opportunities, strategic investments, licensing agreements, and acquisitions hold significant potential. Apart from the above mentioned, investments in research and development activities would present potential growth opportunities for oxycodone manufacturers. Increasing strategic collaborations between manufacturers and generic drugs distributors operating in the pain management business, will prove critical to forward expansion plans. As demand for oxycodone remains uniform across patients of all age groups, opioids are expected to offer effective drug formulations and enhanced solubility of API, further prompting manufactures to capitalize on the emerging latent opportunity. 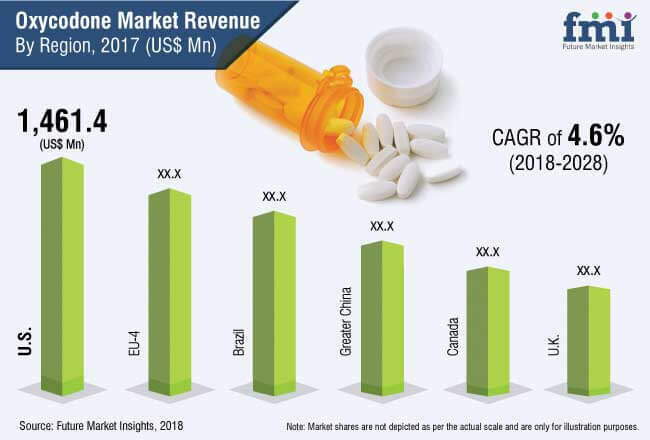 Rising prevalence of chronic diseases in humans and increasing demand for parenteral formulations around the world, particularly in North American countries, will supplement to the growth of oxycodone market in the region.